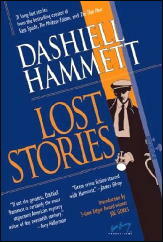 My recent experience with the first Continental Op story (related here ) took me on a sort of Hammett binge which brought me to the collection of his Lost Stories (Vince Emery Productions, 2005). There are 21 tales in this book, but most of them don’t qualify as crime fiction, and those that do are familiar to many of us in the somewhat shorter versions published by Fred Dannay, first in various issues of Ellery Queen’s Mystery Magazine and then in the Hammett paperback collections he edited. Seventeen of the 21 date from Hammett’s earliest years as a writer, 1922-25, when he hadn’t yet developed his distinctive style. Only in “Night Shade” and the non-criminous but fascinating Hollywood tale “This Little Pig” (Collier’s, March 24, 1934) do we find the Hammett we know from his five superb novels. 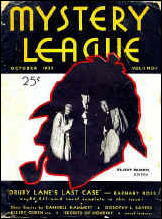 “Night Shade” first appeared in the debut issue (October 1933) of Mystery League, which was founded and edited by Fred Dannay and Manny Lee and folded after four months. But there are other links to Queen in these pages. The 21st and last of the Lost Stories is “The Thin Man and the Flack” (Click, December 1941), which almost certainly was not written by Hammett. This throwaway is not so much a story as a stunt to promote the “Thin Man” radio series, with photographs of various actors pretending to re-enact key scenes. One suspect was played by a little-known actress named Kaye Brinker. A few months later, while appearing in an episode of the Ellery Queen radio series, she met and began dating Manny Lee. They married in July 1942 and the marriage lasted until Manny’s death in 1970. A special plus of Lost Stories for Queenians is that we get to see her as she looked around the time she joined the Queen family. In 1948, during the Queen program’s last few months on the air, Brinker took over as Ellery’s secretary Nikki Porter, which makes her the last actress to play that role in any medium. 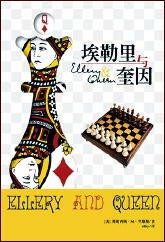 Not that many readers of this column are likely to read Chinese, but a small publisher from that country recently contracted with me to issue a modest-sized book called Ellery and Queen containing a number of my essays on EQ. This volume will include a few paragraphs I’ve written directly for translation into Chinese, discussing the 11-book series of mysteries that was aimed at a juvenile audience and published as by “Ellery Queen, Jr.” All except the ninth and tenth featured Djuna, the houseboy character from the early Queen novels, and share a title pattern — The (Color) (Animal) Mystery — derived from the pattern Fred and Manny had used from The Roman Hat Mystery (1929) through The Spanish Cape Mystery (1935). All eleven were ghost-written. Fred had nothing to do with them but Manny seems to have edited and supervised them. The first eight titles in the series were The Black Dog Mystery (1941), The Golden Eagle Mystery (1942), The Green Turtle Mystery(1944), The Red Chipmunk Mystery (1946), The Brown Fox Mystery (1948), The White Elephant Mystery (1950), The Yellow Cat Mystery (1952) and The Blue Herring Mystery (1954). As Samuel Duff he was the author of “The Bow-Street Runner” (EQMM, November 1942), a historical whodunit—narrated in first person by a Cockney — which was one of the earliest original stories to appear in the magazine Fred had founded in 1941. The author of Golden Eagle and Green Turtle was Frank Belknap Long (1901-1994), a specialist in pulp horror fiction, whose correspondence with fellow horror maven August Derleth includes statements that he wrote two of the series, although he doesn’t mention the titles. After an eight-year hiatus in “Ellery Queen, Jr.” titles, Golden Press issued The Mystery of the Merry Magician (1961) and The Mystery of the Vanished Victim (1962), both featuring Ellery’s nephew Gulliver Queen as youthful sleuth. These and the eleventh and final entry, The Purple Bird Mystery (1966), were apparently written by James Holding (1907-1997), an advertising executive who turned to writing mystery novels for juveniles after the tragic death of his son. But on at least one occasion Holding seems to have employed a second-order ghost to do the work for him, and Manny Lee went livid when he found out. Among adult readers Holding is best known for two series of short stories in EQMM, one (1962-70) featuring professional assassin Manuel Andradas, known as The Photographer, the other (1960-72) following two mystery writers, the creators of fictional sleuth Leroy King, as they solve “real” crimes while on a world tour. The titles of these tales, from “The Norwegian Apple Mystery” to “The Borneo Snapshot Mystery,” employ the familiar pattern of the early Ellery Queen novels. 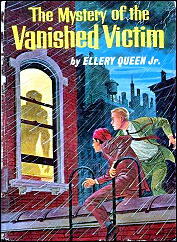 By the time The Purple Bird Mystery came out, Pocket Books was publishing the last of the 15 original paperback novels signed as by Ellery Queen but, as has long been known, ghosted by others under Manny Lee’s supervision. 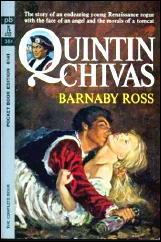 During those years Pocket was also using another Dannay-Lee byline, Barnaby Ross, for six historical novels beginning with Quintin Chivas (1961) and ending with The Passionate Queen (1966). All six were written by Don Tracy (1905-1976), the author of a number of thrillers and historicals under his own name, including several published by Pocket Books. Whether Manny Lee supervised these as he had all the ghosted Queen books is uncertain. He and Fred must have received some money under this arrangement. But why did the publisher bother to pay them anything? It can’t be coincidence that, during the same years Pocket was issuing ghosted paperbacks as by Ellery Queen, it was also putting out another line of softcovers under another Dannay-Lee byline. As far as I can tell, Pocket never made the slightest attempt to lure potential readers into identifying the byline on these six historicals with the byline on the four Drury Lane detective novels of 1932-33. What would have been the point? If there was no point, why not just publish all six as historical adventures by Don Tracy, without the Barnaby Ross byline and without having to pay Fred and Manny for its use? Perhaps someday the business correspondence dealing with these books will be unearthed and allow us to understand a sequence of events which on its face makes no sense. Many years ago I made myself read one of those historicals. One was quite enough. Never again! I read a few of the Queen juveniles many years ago. 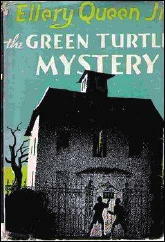 If memory serves, The Green Turtle Mystery wasn’t bad at all. It is not very EQ like, though. I wish the Queen cousins had experimented with a juvenile of their own. This article is full of useful information. Thank you. I believe I still have Green Turtle in paperback, though I may have decided I wasn’t going to read it and swapped it off to someone else. Mike’s bringing the “Jr.” series up again has intrigued me — I hadn’t realized that there so many of them! — and I’m going to scour around and see if I can’t find some cheap copies to satisfy my curiosity. I’m not expecting “Ellery Queen” type of detection, though! Did Dannay & Lee actually receive money for the use of ‘Barnaby Ross’? I mean, is there a paper trail? 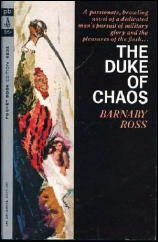 On the basis of what I’ve read, I’ve always thought that the EQ team had long since discarded ‘Ross’ (I believe that by this time all the Drury Lane’s had been reissued with the EQ byline), and that Pocket Books simply came up with a generic byline for a fancy-pants historical – pure coincidence, with no Dannay-Lee connection at all. If I’m wrong about this, by all means correct me.